"Who's picking me up from school today?" "Daddy is. Have a good day, and follow directions." "If I don't follow directions, you'll pick me up?" "um.. *sigh* no, don't worry, Daddy is picking you up today." I know, married or not, there is always a "fun" parent (the Fabulous CamiKaos - who is married, will attest to this fact). Then there is the parent that makes you eat your veggies, wash your hands after using the potty, doesn't let you watch Pokemon, and sends you to bed at a reasonable hour. I thought for sure THIS weekend, I qualified as the FUN parent. For two days I told the ShortBus that we were going to go visit pirates... he was so excited, he could hardly sleep the night before. That was probably my fault, we tried on our costumes, and ran around like pirates for an hour before bedtime... oops. I let him direct the entire day (once we actually managed to get dressed and get out of the house). It helped a ton that I knew half the people out there (*wave* thanks for helping to make his day so totally awesome! 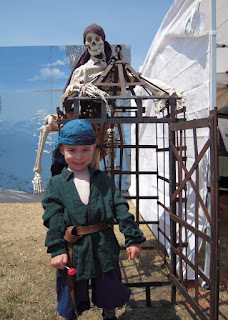 ), he was personally greeted by tons of pirates and a mermaid, helped work at several booths, and even got close up and personal with the Danse Macabre and The Bruno Band. Of course, for a kid that doesn't know any better... that's just how all faires are. He really has no idea that he's getting any special attention. Then Sunday rolled around... Father's Day. He knew the plan was that he would go with daddy in the morning, have a picnic in the park, then I was going to pick him up, and we were going to barbecue with Nana and Papa (my parents). But, when I arrived at the park to pick him up, he freaked out. Screaming and crying and clinging to daddy as if he'd never see him again. And, I really do realize that it has nothing to do with me... it's not that he doesn't love me, or want to be with me... it's that he doesn't get to spend enough time with his daddy. By the way, ShortBus calmed down a few minutes into the drive to my parent's house thanks to CSB tickling him and teasing him, and generally being great. We had a fun evening with my parents, and ShortBus fell asleep almost immediately when we got home. Even though I'm not the "Fun" parent, I think I do pretty well... and really, I think I have all of you to thank for helping me with that. when it comes down to crunch time.. to being needed, being the fun parent can have some real drawbacks. I try to remember that when I am not the fun one. Oh man the "fun" parent. That I am not and I'm totally ok with it! When you only see "fun" parent every other weekend, assume that they are entitled to have their fun. It's like sending them to a party for two days and then picking them up from the candy induced coma and nursing them back into reality. Aint life grand! I get that with daddy AND Nana! PUNKS! 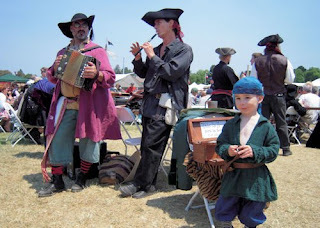 My parents didn't let me dress up like a pirate and have fun like that! I'd say you are the fun one! You're on the right path...keep moving forward!